Introduction Female genital mutilation (FGM) is an issue of global concern. High levels of migration mean that healthcare systems in higher-income western countries are increasingly being challenged to respond to the care needs of affected communities. Research has identified significant challenges in the provision of, and access to, FGM-related healthcare. There is a lack of confidence and competence among health professionals in providing appropriate care, suggesting an urgent need for evidence-based service development in this area. This study will involve two systematic reviews of qualitative evidence to explore the experiences, needs, barriers and facilitators to seeking and providing FGM-related healthcare in high-income (Organisation for Economic Cooperation and Development) countries, from the perspectives of: (1) women and girls who have undergone FGM and (2) health professionals. Review methods Twelve databases including MEDLINE, EMBASE, PsycINFO, ASSIA, Web of Science, ERIC, CINAHL, and POPLINE will be searched with no limits on publication year. Relevant grey literature will be identified from digital sources and professional networks. Two reviewers will independently screen, select and critically appraise the studies. Study quality will be assessed using the Joanna Briggs Institute Qualitative Assessment and Review Instrument appraisal tool. Findings will be extracted into NVivo software. Synthesis will involve inductive thematic analysis, including in-depth reading, line by line coding of the findings, development of descriptive themes and re-coding to higher level analytical themes. Confidence in the review findings will be assessed using the CERQual approach. Findings will be integrated into a comprehensive set of recommendations for research, policy and practice. Dissemination The syntheses will be reported as per the Enhancing Transparency in Reporting the Synthesis of Qualitative Research (ENTREQ) statement. Two reviews will be published in peer-reviewed journals and an integrated report disseminated at stakeholder engagement events. PROSPEROregistration number CRD42015030001: 2015 and CRD42015030004: 2015. Will illuminate health professional and organisational factors that influence choices and behaviour on providing female genital mutilation (FGM) care and following FGM management protocols in a range of healthcare settings (not just maternity settings). Will develop an in-depth understanding of women’s/girl’s care seeking choices, barriers and experiences across the life course (not just maternity settings). Will synthesise research in similar high-income contexts so that findings can be directly translated into interventions and service initiatives across Organisation for Economic Cooperation and Development countries that share similar challenges in service provision and uptake. This is a participatory collaborative project that involves community representatives from identification of the initial questions through to dissemination. The systematic reviews will only include qualitative empirical evidence. Hence, a limitation is that opinion pieces, editorials and case studies of personal or professional experiences will be excluded. There are 30 countries where FGM is traditionally practised, with over 200 million women and girls affected worldwide, mainly from Africa and parts of Asia.2 However, increased migration means that FGM is now regularly seen within health services in higher income ‘receiving’ countries where refugees and migrants from practising countries have settled.2 8 It has been estimated that over half a million women and girls residing in European Union (EU) countries are FGM survivors.8 Within the UK, it is thought that approximately 137 000 women and girls living in England and Wales have undergone FGM,9 and that, since 2008, women with FGM make up approximately 1.5% (nearly 11 000) of all maternity episodes.9 Hence, health services and health professionals in receiving countries are increasingly being challenged to develop appropriate services and to care for women/girls who have undergone FGM in a culturally sensitive manner.6 10 Migrant’s access to healthcare in these countries can be problematic, however, due to a range of socioeconomic, legal, language and cultural barriers.11 12 The ways in which these factors intersect to affect appropriate care delivery for women/girls who have undergone FGM—a particularly sensitive and personal issue—is currently unclear. In the UK, a range of policies and protocols around FGM prevention and care have been developed over the last decade. These set out safeguarding procedures to mitigate risk of FGM and recommend a multiagency approach to service development.6 37 In the UK, these include a declaration to end FGM in 2014, the establishment of a National FGM Prevention Programme, development of Intercollegiate Guidelines,38–40 mandatory recording using the SCCI2026 FGM Enhanced Dataset Information Standard, the Serious Crime Act 2015 and mandatory reporting of girls at risk of FGM.41 Many other Organisation for Economic Cooperation and Development (OECD) countries have similar laws barring FGM, including direct prosecution of individuals continuing the practice.37 42 All EU countries consider FGM a crime of serious bodily harm, with legal measures to safeguard minors and professional provisions for disclosure and duty to report.37 Approaches to prosecution are varied, resulting in calls for efforts to improve and correct the inadequate care of women and girls who have undergone FGM,43 specifically for multidisciplinary approaches.13 44 It is currently unknown how these legal and regulatory provisions impact on the experience of seeking and providing healthcare from patients’ and health professionals’ perspectives. 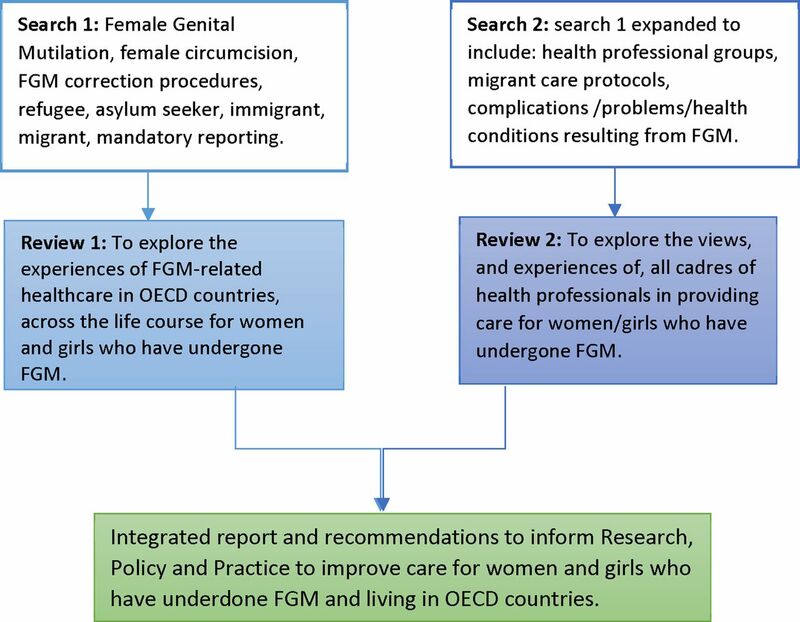 There are a number of systematic reviews related to FGM healthcare that have been published to date, but all have taken a multicontext (or ‘lumping’) approach to the evidence,13 50 62–64 by including research from high-income and low-income settings across the world. Many key themes from these reviews therefore are drawn from evidence from very different contexts (see Sunday-Adeoye and Serour52) and are not easily transferable to a high-income setting. These countries generally have strong, well-resourced public health systems and FGM is primarily found within their migrant populations.2 FGM care and its challenges in these settings, will therefore, be linked to other challenges around providing care for migrant populations (such as lack of familiarity with cultural norms, systems or communication issues11). This is a very different situation compared with countries where health systems are weak, where FGM is more prevalent, where health providers may have greater exposure to, and indeed, may even be complicit in, FGM (ie, medicalisation of FGM).65 In order to address this shortcoming, the proposed systematic reviews of women’s and health professionals’ experiences will focus exclusively on evidence from high-income OECD contexts. The aim of this review will be twofold: to understand the experiences, needs, barriers and facilitators around seeking and providing FGM-related care in OECD countries from the perspectives of (1) women and girls who have undergone FGM and (2) health professionals. Hence, this will involve two reviews of qualitative evidence. Review 1: to explore the experiences of FGM-related healthcare in OECD countries across the life course for women and girls who have undergone FGM. To illuminate factors that influence FGM-related healthcare seeking and access to health services across the life course. To explore how quality of care is perceived and experienced in different healthcare settings and with different groups of healthcare professionals. To characterise and explain elements of service provision considered important for the provision of acceptable and appropriate healthcare. To describe factors perceived to influence open discussion and communication around FGM (including prevention) with health professionals. Review 2: to explore the views on, and experiences of, all cadres of health professionals in providing care across the life course in OECD countries for women/girls who have undergone FGM. To explore how quality of care for women/girls who have undergone FGM is perceived in different healthcare settings and among different professional groups. To characterise and explain elements of service provision considered important for the provision of high quality care to women/girls who have undergone FGM. To illuminate factors perceived to facilitate or hinder appropriate provision of care for women and girls who have undergone FGM. To identify processes and practices perceived to influence open discussion and communication around FGM (including prevention) with women/girls from affected communities. The review methodology uses a participatory approach in which its aims and objectives were generated together with community organisations working in the field of FGM who continue to be involved as co-investigators and advisors.66 The project originated from a request by a community organisation run by, and working with, FGM-affected women to explore women’s and health professionals’ experiences in the healthcare encounter related to FGM. The review team and advisory group includes members of FGM-affected communities and their perspectives will be integrated into project activities at every stage, for example, in identifying relevant grey literature, contributing to interpretation of key themes, helping to formulate recommendations and helping to access professional and community networks to aid dissemination and community engagement. The findings of the two reviews will be reported separately and then, where appropriate, integrated (figure 1) to enable greater understanding of key issues or concepts when presented from multiple perspectives. The findings will be brought together into a comprehensive set of recommendations for service development, community engagement, health professional education and future research. The project will implement a comprehensive search strategy to gather all available and accessible studies, including peer-reviewed articles and grey literature. Primary research articles in the form of journal papers, research/evaluation reports, theses and dissertations will be collected. Reference lists from primary papers and key reviews will be hand searched to identify additional papers. There will be no language or date limits. Searching will be done in at least 12 databases to include Medline (Ovid), Embase, Scopus, PsycINFO, Web of Science, ASSIA, CINAHL, ERIC, MIDIRS using a detailed search strategy (see Appendix 1 in the online supplementary file 1). Additional searches will be carried out in relevant indexes such as POPLINE, grey literature databases including: British library, National Institute for Health and Care Excellence evidence services, index to theses, Networked Digital Library of Theses and Dissertations, ProQuest and other accessible digital thesis and dissertation repositories. The search strategy was developed from an initial scoping search undertaken to establish relevant search terms and potential databases and to develop a robust integrated, but specific and sensitive strategy. It is vital that we have a comprehensive search strategy because of known poor indexing of qualitative studies. Therefore, the scoping search will identify records which will be cross-checked for indexing, together with FGM reports and guidelines from WHO to ensure correct terms and FGM-related terms are captured. The Librarian (JE) together with RT will develop and conduct all the searches. The comprehensive search will be tailored to each of the listed databases for both peer reviewed and grey literature and results reported in a flowchart following Preferred Reporting Items for Systematic Review and Meta-Analysis Protocols guidance. No limits will be placed on language or publication year in the search strategy. We will include articles available from the start of database indexing to present (up to 31 December 2017). The scoping search will run from April to June 2017, and the expanded search will run from July to October 2017. We will set-up automatic search alerts and updates until 31 December 2017. Electronic searches are summarised in figure 2 and an initial detailed search strategy is attached in Appendix 1 in the online supplementary file 1. All returned results from the searches will be entered into the EndNote reference manager programme. Screening will be undertaken independently by two reviewers using title and abstract and studies selected if they meet the a priori selection criteria (see figure 3). In case of disagreement, there will be recourse to a third reviewer when required. Screening checklist. FGM, female genital mutilation; OECD, Organisation for Economic Cooperation and Development. Population: Women and girls who have undergone FGM, and their experience of FGM-related healthcare, or healthcare professionals or students involved in the care of women and girls that have undergone FGM. Phenomenon of interest: Experiences of seeking, receiving or providing FGM-related healthcare across the life course. Context or setting: Studies conducted in OECD/high-income countries as described by the World Bank (list attached in Appendix 1 in the online supplementary file 1). Study type: Any type of qualitative study and any type of mixed methods study that reports qualitative findings. Search limits: No language or date limits. The abstracts of articles not in English will be translated and assessed. Those that meet the screening criteria will then be professionally translated into English for appraisal and data extraction. Exclusion: Any papers or research that was not undertaken on women and girls who have undergone FGM, or healthcare professionals, or not in OECD countries. Studies will be excluded if they do not describe FGM-related experiences of healthcare or provision of healthcare. The role of critical appraisal in qualitative evidence synthesis is contested and there is lack of agreement over: (1) the appropriateness of excluding studies, (2) the potential impact (or not) of excluding eligible papers on review outcomes and (3) the criteria on which quality should be established.68 73–75 For these reasons, the project will adopt an inclusive approach to critical appraisal, using the appraisal process to enable an in-depth understanding of each paper and to facilitate a critical, questioning approach to the study findings.76 Studies will not be excluded on the basis of quality, rather, the quality assessment will be used: (1) to judge the relative contribution of each study to the overall synthesis and (2) to assess the methodological rigour of each study as part of a process of assessing confidence in the review findings.77 The quality of included studies will be assessed independently by two reviewers using the Joanna Briggs Institute Qualitative Assessment and Review Instrument.78 79 This tool has been found to be more coherent and more sensitive to assessment of validity than other commonly used tools.75 An extract summary of the appraisal items is listed in figure 4. Extracted Joanna Briggs Institute quality appraisal tool. Data extraction will primarily be undertaken by one reviewer with a second and third reviewer each checking a random sample of the articles for completeness in extraction. Data will be extracted using a modified JBI data extraction form (figure 5) to include details of the phenomenon of interest, population, context, study methodology, methods and findings of significance to the review objectives.78 80 If studies lack relevant detail, authors will be contacted to provide further information. The ‘results/findings’ sections from each study will be entered into NVivo for further analysis and synthesis. There is ongoing debate over what constitutes a ‘finding’ in qualitative research and how to differentiate between findings—that is, the study authors’ analysis/interpretation of the primary data and other inferences or conclusions made by the authors.72 81–83 In this review, we will follow the approach advocated by Thomas and Harden57 in which the ‘results/findings’ section of each paper will be entered into NVivo for detailed thematic analysis (described below). However, if, on reading a paper, it becomes clear that a finding is reported elsewhere (eg, in the abstract or discussion section), this excerpt will also be extracted into NVivo. Data extraction tool to include all the results and findings sections of each included study. Where a paper presents findings on both women’s and health professional’s experiences, the relevant sections will be extracted for each review separately where possible. The review findings will be assessed using the GRADE-CERQUAL guidelines.77 The assessment of confidence in the evidence for an individual review finding considers four elements: (1) methodological limitations (the extent to which there are problems in the design or conduct of primary studies that contributed to evidence of a review finding); (2) relevance (the extent to which the body of evidence from the primary studies supporting a review finding is applicable to the context specified in the review question); (3) coherence (whether the finding is well grounded in data from the primary studies and can provide a convincing explanation for pattern found in the data) and (4) adequacy of data (an overall determination of the degree of richness and quantity of data supporting a review finding).77 Based on the assessment, each review finding will be assigned one of the four levels of confidence: high, moderate, low and very low. Each review will be reported in accordance with the ‘Enhancing Transparency in Reporting the Synthesis of Qualitative Research’ (ENTREQ) statement,84 appropriate for qualitative evidence synthesis, which consists of 21 items (see table 1). The participatory collaborative approach to this qualitative evidence synthesis project will enhance the multidisciplinary interpretation of findings in order to inform stakeholders and the development of FGM-care initiatives for improved confidence and quality of service provision to women and girls who have undergone FGM. The two qualitative systematic reviews will be published separately in open access, peer reviewed, international journals and an integrated report compiled and widely disseminated to FGM stakeholders through stakeholder engagement events, round-table discussions with different stakeholder groups and tailored materials for each of the stakeholder groups (academic, health professionals, policy makers/commissioners, FGM communities and community organisations). We shall share the review findings report in the third quarter of 2018, using pre-existing contacts with the WHO Europe FGM group network and through professional networks. 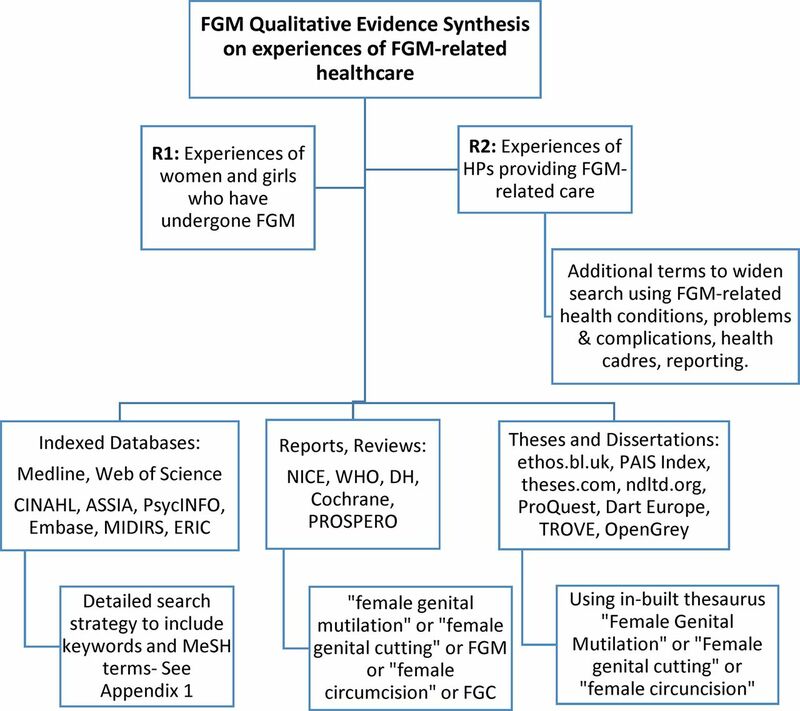 This systematic review is funded under Project: Improving Care for Women and Girls who have undergone Female Genital Mutilation (FGM): Qualitative Evidence Synthesis. Funded by the National Institute for Health Research (NIHR) Health Service Research and Delivery Programme (NIHR 1115/137/04). World Health Organisation. WHO guidelines on the management of health complications from female genital mutilation. Geneva: WHO, 2016. United Nations Children’s Fund. Female genital mutilation and cutting: a global concern. New York: UNICEF, 2016. World Health Organisation. A systematic review of the health complications of female genital mutilation including sequelae in childbirth. Geneva: World Health Organisation, 2000.
. Psychological, social and sexual consequences of female genitalmutilation/cutting (FGM/C): a systematic review of quantitative studies . Oslo: Norwegian Knowledge Centre for the Health Services (NOKC), 2010. HM Government. Multi-agency statutory guidance on female genital mutilation: Department for Education, Department of Health, Home Office, 2016. https://www.gov.uk/government/publications/multi-agency-statutory-guidance-on-female-genital-mutilation.
. Chapter 3: annual report of the chief medical officer: the health of the 51%: women. Female genital mutilation (FGM). London: Department of Health, 2015.
. Prevalence of female genital mutilation in England and Wales: National and local estimates. London: City University, 2015.
. Foundation for Women’s Health Research and Development. Women’s experiences, perceptions and attitudes of female genital mutilation: the Bristol PEER study, 2010.
. “Don’t judge me”: narratives of living with FGM. Ethnicity and Inequalities in Health and Social Care 2017;10:4–13.
. A pilot evaluation of health services for communities affected by FGM in Oxfordshire: final report. Oxford Against Cutting: Oxford, 2016.
. Care for infibulated women giving birth in Norway. Medical anthropology quarterly. 20, 2006:516–44.
. Somali refugee women and their U.S. healthcare providers: knowledge, perceptionsand experiences of childbearing. Dissertation abstracts international section A: humanities and social sciences. 75, 2015.
. Knowledge, attitudes and professional experiences of midewivesin primary health care in Seville on female genital mutilation. Matronas Profesion 2014;15:56–61. Royal College of Midwives, Royal College of Nursing, Royal College of Obstetricians and Gynaecologists. Intercollegiate guidelines tackling FGM in the UK: Intercollegiate recommendations for identifying, recording and reporting. London: Royal College of Midwives, Royal College of Nursing, Royal College of Obstetricians and Gynaecologists, 2013. Royal College of Nursing. Female genital mutilation: an RCN resource for nursing and midwifery practice. 2nd ed. London: RCN, 2015. Royal College of Obstetricians and Gynaecologists. Green-top guideline no. 53: Female genital mutilation and its management. London: Royal College of Obstetricians and Gynaecologists, 2015. Department of Health. Female genital mutilation risk and safeguarding. Guidance for professionals. London: Department of Health, 2016. United States Agency for International D. Female genital mutilation/cutting: United States Government’s response. Washington DC: USAID, 2014.
. Female genital mutilation/cutting: an update. Clin Exp Obstet Gynecol 2015;42:300–3. Medical Research Council. Developing and evaluating complex interventions: new guidance. London, 2008.
. A guide to synthesising qualitative research for researchers undertaking health technology assessment and systematic reviews. Edinburgh: NHS Quality Improvement Scotland and University of Stirling, 2011.
. Community based participatory research. San Francisco: Jossey Bass, 2003.
. “It looks great but how do I know it fits?”: an introduction to meta-synthesis research. In: Hannes H , Lockwood C , eds. Synthesizing qualitative research: choosing the right approach. Oxford: Wiley Blackwell, 2012:1–21.
. Transforming qualitative data: thematic analysis and code development. London: Sage, 1998.
. Supplementary guidance for inclusion of qualitative research. Cochrane systematic reviews of interventions, Version 1, 2011.
. Obstacles to the implementation of evidence based practice in Belgium: a worked example of meta-aggregation. In: Hannes K , Lockwood C , eds. Synthesizing qualitative research: choosing the right approach: Wiley Blackwell, 2012:21–41.
. Synthesizing qualitative evidence. Philadelphia: Lippincott-Joanna Briggs Institute, 2011. The Joanna Briggs Institute. Critical appraisal checklist for qualitative research. 2016 http://joannabriggs.org/research/critical-appraisal-tools.html. The Joanna Briggs Institute. JBI QARI data extraction form for interpretive and critical research. 2016 http://joannabriggs.org/assets/docs/jbc/operations/dataExtractionForms/JBC_Form_DataE_IntCrit.pdf.
. Qualitative and implementation evidence and cochrane reviews, version 1.02a. In: Higgins JA , Green S , eds. Cochrane handbook for systematic reviews of interventions version 530, 2015.
. Factors that impact on the use of mechanical ventilationweaning protocols in critically ill adults and children: a qualitative evidence-synthesis. Cochrane Database Syst Rev 2016. Contributors CE conceptualised the project and prepared the project documents as PI in collaboration with the team members GH, JM, CC and VN. JE developed the search strategy and will carry out the searches. RT prepared the manuscript with CE and input from team members. All team members reviewed and approved this manuscript. Funding The National Institute Health Research (NIHR) Health Service Research and Delivery Programme (NIHR 1115/137/04).